Law enforcement from across Cape Cod received a special visit Wednesday from Donut Boy at the Barnstable County Sheriff’s Office in Bourne. 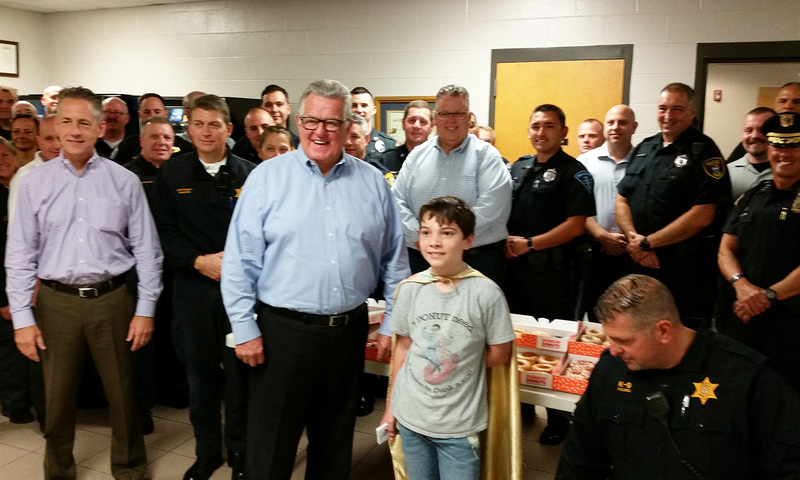 Tyler Carach, 10, from Florida, passed out donuts to deputies and officers from several local police departments. Since 2016, Tyler has visited 40 states and distributed more than 70,000 donuts. It started when he asked his mother if he could buy mini-donuts with his allowance money for four deputies. Tyler said it is important to thank police for the work they do. “The police officers risk their lives for strangers and their families so I wanted to thank them for what they did,” he said. Tyler and his mother were invited to the Cape after a Barnstable County Sheriff’s Office Lt. Kevin Fernandes met them at an airport and invited them here. County Sheriff James Cummings said Tyler brought some happiness to local law enforcement after a tough year in the region with the death of Yarmouth Sgt. Sean Gannon and the non-fatal shootings of two Falmouth officers. Cummings said Tyler is a sharp young man who really has it together. Tyler travels across the county to visit police with his mother, Sheena Carach. She said it is unfortunate that there are some people who judge all police officers based on the actions of a few. Tyler was persistent in his quest and the family started by thanking officers in Florida before branching out to dozens of other states. Tyler and Sheena will travel to Maine Thursday before heading to the Pittsburgh area in Pennsylvania before returning home on Sunday. The longest trip they have made has been six weeks straight. Sheena said they plan to keep going even after they make trips to all 50 states. “We just hope to see this get bigger and better,” Sheena said. They are currently working on getting 501(c)3 non-profit status.